The United States says recognition of opposition leader Juan Guaido as Venezuela’s interim president is the only way to restore democracy in that country. Russia and China, however, continue to support President Nicolas Maduro. “The government is going to strangle us even more with their bad decisions and shamelessness,” Pineda said while sharing a meal with two friends. The food cost under two dollars. But, the three friends said they did not have enough money individually to buy it. Maduro appears to have the support of the country’s military. 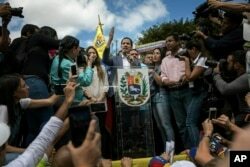 He has accused the U.S. and Guaido of plotting to overthrow him. Maduro says the U.S. then led other nations to recognize Guaido as Venezuela’s leader. That makes it very hard for Maduro’s government to get and control its oil money and holdings overseas. The U.S.-based oil company Citgo is a subsidiary of Venezuela’s national oil company PDVSA. And Venezuela has $1.2 billion in gold in the Bank of England. 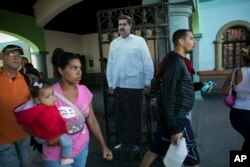 Maduro was elected to a second six-year term in hotly disputed elections held last May. Many opposition candidates were barred from competing for the office. Opposition parties boycotted the voting as a result. And the country’s National Assembly did not recognize the results. Rodriguez compared the situation in Venezuela to what happened to Libya in 2011. At that time, the U.S. government froze Libya’s assets in answer to Libya’s campaign against protesters during the Arab Spring uprising. The U.S. action led to a more than 70 percent drop in the North African country’s oil production. Venezuela has one of the world’s largest oil reserves. But its current oil production is only one third of what it was when the late Hugo Chavez took power in 1999.